Standard's BX - Bill Exchanger Series machines are designed to be an "automated attendant", providing bill change for higher denominations. 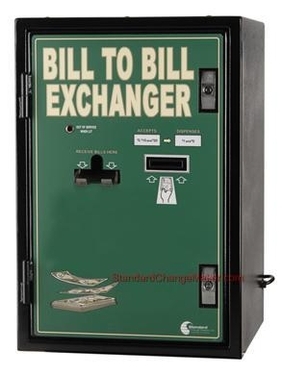 Excellent locations for Bill Exchanger machines are attended or unattended coin laundries, card laundries, car washes, museums, zoos and aquariums, paid parking lots; anywhere that would allow more customer convenience by breaking higher denomination bills into smaller denomination bills. Why make your customers use $20 bills when smaller denomination bills would better serve the purpose, and help contribute to more revenues. The BX1030 features the Fujitsu F53 - Dual Note Bill Dispenser with 3 Bill Cassettes. 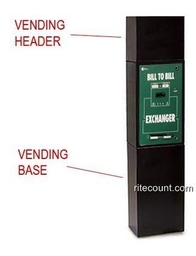 This dispenser uses cassettes that are loaded with bills; and these cassettes have a value based on the denomination in it, are loaded into the dispenser unit. The BX1030 is programmed to dispense the bills from the cassettes as needed to make best change. The additional cassette can be used for a different denomination or added capacity of the same denomination. (EF) Expanded Function Module now Included!